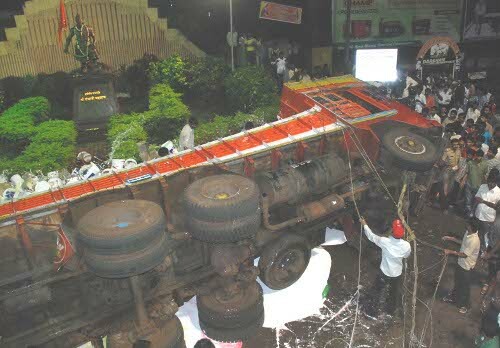 A Truck laden with paints over turned at Bogarves circle infront of the Sambhaji statute at 11.15 pm on Saturday night on a parked car killing Mr.Ajay Annappa Bagewadi(55) owner of Mahila Vastu Bhandar, Maruti Galli who is survived by his wife and two children. Another person who was standing near by was also injured. The cranes arrived at 12 am and eye witnesses say they heard the shouting of Mr.Bagewadi for about 20 mins but they could do nothing as the entire truck had over turned on the car and only the crane could lift. This is really a shocking news to all, coz we are also family .if from our family we loose one person suddenly how we feel we cant imagine iam really feeling bad for bagewadi family they have lost a head of family member so how they are realizing we cant imagine, i blame the belgaum police they have not maintain any traffic rules in the city and they should not allow the heavy motors to enter in city even if they they should fix a speed limit, please god give them a strength and piece of mind to bagewadi family. Ajit was a very good family friend. I feel very sad for him. God give his family the strength to bear the loss. A survey regarding the number of drunkard drivers and the number of cases filed against them should be conducted. Traffic Police, S P. or D C. whom soever can control this should fix a speed governor on this route from k L E to Rani Channamma Circle to Piranwadi Cross for 24 hours. THERE WERE DAYS WHEN ONE LOVED TO ROME AROUND AND DRIVE ON BELGAUM ROADS. NOT ANYMORE, THANKS TO THE EVER INCREASING NUMBER OF VEHICLES, SPECIALLY BIKES AND THE I DONT CARE LIKE TEN WHEELER DRIVERS. THE MAN IS DEAD AND WHO REMEMBERS IT THE NEXT DAY EXCEPT HIS DEAR ONES? THESE TRUCKERS HAVE REALLY MADE THE CITY LOOK LIKE EVER SO SMALL AND HAVE NO RULES TO FOLLOW. AND NO POLICE TO FEAR. CAN ANYONE FROM RTO OR POLICE TELL ME HOW MANY TRUCKS HAVE BEEN BOOKED FOR MOVING ON THE RIGHT SIDE OF THE ROAD IN THE CITY AT A SNAIL'S PACE, CAUSING AGONY TO THE OTHER VEHICLES FOLLOWING? OR IS IT THAT YOU CAN MOVE ON ANY SIDE OF THE ROAD? 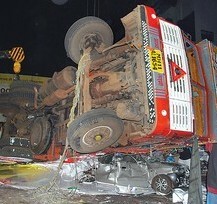 Its due to irresponsibility of Police who allows overloaded truck and drunkers by taking bribe one has to pay for that. And even police cant do anything for mining trucks bcoz all political are behind the seen.